Computer Technology encompasses many areas today, including building and maintaining PCs, networking, and programming different types of devices. With the popularity of web based software and hand held devices, students are trained in how to develop dynamic and mobile friendly websites. 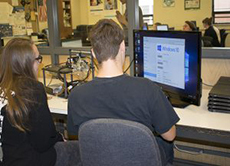 Computer programming (software development) is another popular career path, and students learn to code using languages such as C++, Visual Basic, and Python. In addition, students will be exposed to computer forensics while completing interesting and challenging labs. 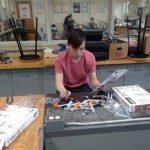 Computer repair and maintenance, in addition to computer networking, round out the very broad Computer Technology curriculum. You should have an interest in various areas of computer technology, and above average logic and problem-solving skills. You will need good work habits and study skills, as well as a desire to produce neat and accurate work. Students will also be expected to follow written and verbal instructions well. Drafting and Design includes making accurate working plans and detailed drawings from rough sketches to be used for Architecture or manufacturing purposes. Technology demands precision and standardization, and drafting meets this need by providing an accurate and efficient method of recording and analyzing ideas. You should like to draw, especially drawings from which something can be built. You should be able to visualize objects and be mechanically inclined. Being systematic and thorough in your schoolwork and outside activities is helpful to the drafting student. 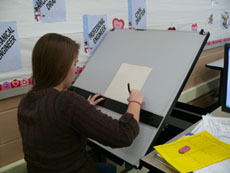 You will also be required to sit at a drawing board or computer for long periods of time. Additionally, you should like working on projects with considerable detail and have an interest in mathematics and science. A background and understanding in Geometry is an advantage for the program as well. Students entering into the Drafting and Design Technology program will learn board drafting skills as well as AutoCAD skills. Upon learning the basics we begin to learn more specific practices in the Mechanical Drawing, Architectural Drawing, Civil Drawing and Electrical/Electronic Drawing areas. Students will possess the skills needed to work as an entry level Draftsperson for Machining companies drawing blueprints, Architectural firms drawing home design plans and details, Civil/Survey firms drawing civil design drawings or Electrical/Electronic companies drawing schematics of circuitry. Students are also introduced to Revit and Inventor (AutoDesk products). Students have the opportunity to earn college credits through a program known as Penn College NOW. Students are required to take a college placement exam for Pennsylvania College of Technology, upon successfully completing and passing the exam they are eligible for up to six college credits through the University. Students are able to take and Introduction to Architecture course as well as Level one CAD course. Students complete the courses while enrolled and studying at CMAVTS. Any manufacturing industry needs technicians to design, repair, and install this equipment in today’s advanced manufacturing environment. Mechanical Technology marries seamlessly with Power Generation and Distribution to create a professional tradesperson known as an Electro-Mechanical Technician. This skilled professional designs, installs, troubleshoots, and repairs today’s modern automated manufacturing equipment. Electro-mechanical technicians are generalists in technology, and their broad skill set will help sustain the high-demand for their services. In Machatronics, you will learn about Industrial Motor Controls, Programmable Logic Controller (PLC Control), Pneumatics, Hydraulics, and Industrial AC and DC Motors, Power Generation and Distribution, Transformers, AC and DC Variable Speed Drives, Mechanical Drive Systems, Robotics, Electronics. You should have a strong interest in electronics and above average abilities in math and science. Much of the material taught is very theoretical and you should, therefore, have the ability to work with invisible quantities. Good manual dexterity is also required. We live in a visual world! Printing and Graphics is a $898 Billion global industry and drives $3.8 Trillion in related services. It is exciting and ever changing. This industry employs individuals to create and produce product packaging and labeling, magazines, indoor and outdoor signage, web and mobile pages, informational catalogs, promotional material, individualized direct mail, textiles, and millions of other specialty imaged materials. Students are exposed to basic layout and design principles using Adobe Creative Suite. 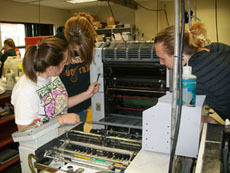 Students are also introduced to –using hands-on projects– graphic design, digital imaging, wide-format printing, direct-to-garment printing, introductory digital photography, image manipulation, screen printing, dye sublimation, heat applied graphics, hydrographics, graphic image applications/installations and finishing operations, just to name a few. First and foremost, you should possess a positive attitude and ability to work and learn in a fast-paced, group centered environment. As new technologies are developed and introduced, a willingness to learn is imperative. These qualifications are essential for success in the Printing and Graphics lab and industry. Creativity, color perception, problem-solving capabilities, neatness, organizational skills, attention to detail, dependability, and self-motivation are fundamental qualities necessary for success. The ability to communicate effectively—both verbally and in writing, type, self-educate, willingness to try new and innovative thoughts and processes, multi-tasking, working within deadlines, and an understanding of basic mathematical and scientific principles are also required for success within the printing and graphic industry. What Will I Do As a 9th Grade Student? This exploratory program will offer a student an opportunity to experience both hands-on and theoretical information about Printing Technology. These experiences are aimed to generate interest, and general knowledge within the Printing Technology field. A ninth grade student will experience introductory skills in layout and design, polyester platemaking, offset press operations, bindery skills, and silk screen printing technology. Freshmen will be required to complete, at a minimum, three projects. The design and production of a memo pad will be the first project completed. The second project will be a creation and production of business cards. The third project is the creation of a silk screen project (T-shirts are the most widely chosen option). More advanced freshmen will advance into introductory vinyl lettering and heat transfer imaging.